Hundreds of thousands of people marched through the streets of Rome on Saturday to protest the populist government’s economic policies. Demonstrators from across Italy travelled to the capital using 12 special trains, 1,300 coaches, ferries and low-cost flights. Several of Italy’s largest trade unions called for the demonstration against inequality, unemployment and racism under the coalition government, which came to power last year. 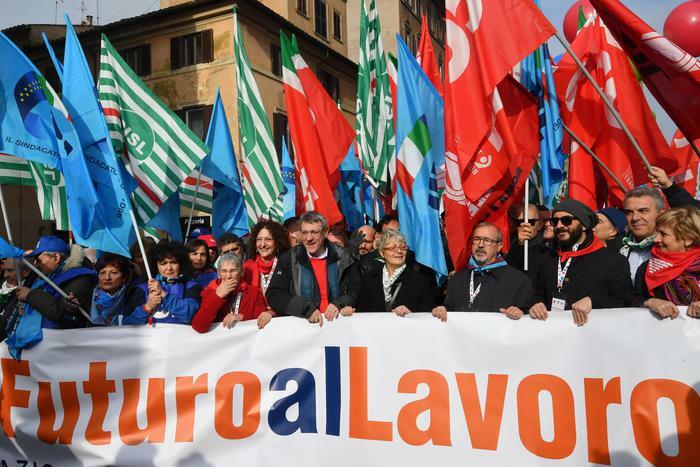 “There are structural knots in Italy that this government is not dealing with, unfortunately, like previous governments,” said Maurizio Landini, head of the Italian General Confederation of Labor (CGIL), which claims 5.5 million members. At 9.7 per cent, Italy has one of the highest unemployment rates in Europe after Greece and Spain. The protesters marched under the banner “A Future for Work”. The demonstration aimed to highlight youth unemployment in particular. In 2017, 16.7 percent of young people were without work, double the EU average. Protesters argue that the government’s plans to introduce minor pension reforms and to give poor Italians a small basic income are insufficient and misguided. Deputy Prime Minister and leader of the Five Star Movement (M5S), Luigi Di Maio, snapped back at critics, saying Italy’s dire economic state is the result of previous governments’ policies. Italian unions were also outrage by a meeting between Di Maio and members of France’s anti-government “yellow vest” movement. “It is unusual, to say the least, that a deputy prime minister finds the time to meet opponents of the government in a neighbouring country but doesn’t have the time to meet with the opposition in his own country, i.e. the unions,” Landini said on Friday. Saturday’s demonstration was the biggest in Italy in four years.